The miracle of the latest technological advances can be at your doorstep with the installation of the latest and most modern Doorking intercom gate system. We only provide our customers with the best gate repair services and most high tech solutions but we also take into account their own needs and requirements of their properties. “Gate Repair Granada” is devoted in this business for multiple years and knows well that great dedication, expertise and constant updating with novelties are the salt and pepper of each company. We make great efforts to keep up with the speeding technology and manage to keep pace because we devote time and invest in the best brands and gate intercom systems. People who have installed gates at their working environment or private residence will certainly enjoy intercom installation. This is not a technological luxury but a mere 21st century necessity in order to deal with crime, unauthorized people trying to get access to the premises, time issues and security matters. Isn't it more convenient and secure to open the gate to your visitors just by pressing a button instead of walking in the dark along the driveway? An Intercom System can surely be connected with your gate keypad and your home phone line. It can give you the opportunity to view who is standing at the gate through a camera and have a conversation with the visitor. You can buzz them in but you can also refuse to open the gate! All from the safety and convenience of your home! These systems are great and our assistance is invaluable when you need them to be installed properly and learn more about them. We like to inform our clients and Gate Repair Granada takes such matters personally. People ought to be aware of their options in order to choose properly and wisely and we can give you a plethora of choices among the finest manufacturers, explain fundamental differences between systems and provide exquisite and fast intercom repair services. 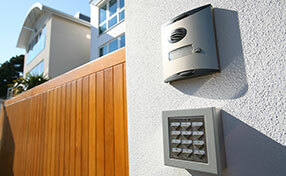 Trust the best in Intercom System services for excellent results, secure homes and offices! Call us today!